The Association of Former Intelligence Officers (AFIO) presents this website to serve our members and visitors as a portal to our activities and to provide word of upcoming educational events by other select intelligence groups. Registration is underway. Will you be attending? 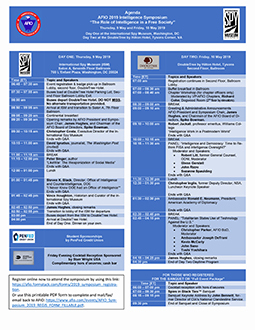 PROGRAM: updated program with speakers and venues is here. Register online now to attend the symposium by using this secure link. Or use this printable PDF Registration form here to be completed and mailed/faxed/emailed back to AFIO. PROGRAM: The tentative program for both days may be viewed here. HIGHLIGHTS: Thursday, 9 May is Day One at the International Spy Museum's New L'Enfant Plaza location two days before they officially open. Buses will depart from the DoubleTree by Hilton, Tysons at 8 a.m. sharp to arrive at the International Spy Museum at 9 a.m. Featuring remarks by COL Christopher Costa USA (Ret. ), Executive Director of the museum; and Dr. Vince Houghton, the museum's Curator and Historian. Other speakers Stephen K. Black, Director, Office of Intelligence and CI, DOE; David Ignatius, author and journalist; Peter Singer, author and futurist. Breakfast and lunch will be provided at the museum. Return trip back to hotel will be at 3 p.m.
Friday, 10 May is Day Two at the DoubleTree by Hilton, Tysons and features a full day of speakers and panels. The day starts with a welcome and orientation by James Hughes, AFIO President, former CIA and NSA, and M.E. Spike Bowman, AFIO Chairman, former Navy, NSA, FBI, ODNI, followed by a presentation by Robert Jackall, Professor Emeritus, Williams College. The morning panel is moderated by Robert S. Litt and covers "Intelligence and Democracy: Time to Rethink FISA and Intelligence Oversight." It features panelists Glenn Gerstell, John Rizzo, Suzanne Spaulding. Our luncheon keynote will be Chris Inglis, former Deputy Director, NSA. Amb. Ronald Neumann, President American Academy of Diplomacy, follows. Christopher Parker's afternoon panel on "Totalitarian States Use of Technology Against the U.S." features panelists Amb. Joseph DeTrani, Kevin McCarty, John Sano, and Toshi Yoshihara. Day Two also includes buffet breakfast and lunch. This second day will close with an evening cocktail reception and our "Spies in Black Ties" Banquet featuring a presentation by John Bennett, former Director of CIA's National Clandestine Service. Day Two Daytime program will begin at 9 a.m. (buffet breakfast and chapter workshop begin at 7 a.m.) Daytime program ends at 4:30 p.m. Cocktail reception and "Spies in Black Ties" Banquet from 6 to 9:30 p.m. Buses will transport attendees from the DoubleTree by Hilton, Tysons to the International Spy Museum and back. The second day of this event takes place at the DoubleTree by Hilton, Tysons, 1960 Chain Bridge Rd, McLean, VA 22102. To be ready for early departure by buses on Day One, it is recommended that attendees consider staying overnight starting Wednesday, 8 May. Reservations may be made online at this link or by calling (703) 893-2100. The special event room rate is $139/night and is available until 6 April 2019 or until all rooms are filled. You must reference our group code AAF. You may also locate rooms at this or other nearby Tysons/Vienna hotels using online services, e.g., Trivago, Expedia, Travelocity, or Orbitz. Many informative, fascinating programs are occuring in the Washington Metro Area and across the country. Find out which ones to add to your calendar to stay connected and to stay current. Learn how your company can make a difference with AFIO corporate memberships and marketing opportunities. Reach more than 4,800 intelligence professionals. Join or renew your existing membership and enjoy member benefits, such as special publications, invitations to events, unique banking & investment services, scholarships, and career assistance. 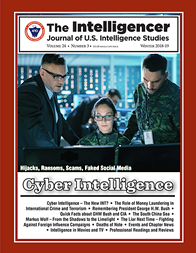 As a member or subscriber you receive the popular Weekly Intelligence Notes [WINs] and the print-only academic journal: Intelligencer - Journal of U.S. Intelligence Studies for the intelligence community by intelligence professionals. 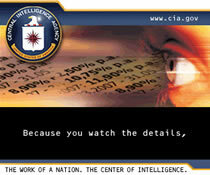 AFIO also produces Intelligence As A Career - a printed and online guide to organizing your life and education to qualify for work in the intelligence community, and a Guide to the Study of Intelligence to assist college instructors, secondary school teachers of history, civics, and current events, and students, on the best readings on a wide variety of current intelligence topics. Learn about us - our many events, publications, programs, and legislative alerts. 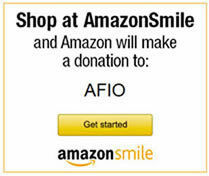 Support AFIO with purchases and donations or meet our members at events throughout the US. Make your views known. Local chapters have appeal to many members, so after you have joined AFIO National, consider adding a local chapter membership to your mix. Monday, 13 May 2019, 5:30 p.m. - New York, NY - AFIO NY Metro hosts Jeff McCausland, discussing "Back to the Future: Battlefield Nuclear Weapons in South Asia." Dr. Jeff McCausland, a visiting professor of International Security Studies at Dickinson College (Carlisle, PA), former Dean of the Army War College. He is currently involved in a project for the National Nuclear Security Administration focused on nuclear weapons in South Asia and proliferation of weapons of mass destruction. He serves as a national security consultant for CBS radio and television. He routinely does analysis for CBS on issues such as Iraq, European security, arms control, or related questions of national security policy. His topic this evening will be: "Back to the Future: Battlefield Nuclear Weapons in South Asia." Location: Society of Illustrators, 128 E 63rd St (between Park and Lexington), New York, NY 10065. Timing: Registration starts at 5:30 pm, Speaker presentation starts at 6 pm. Fee: $50/person. Payment at the door only. Cash or check. Full dinner, cash bar. RSVP: Strongly recommended that you RSVP to ensure space at event. Call or Email Chapter President Jerry Goodwin at afiometro@gmail.com or 646-717-3776. Topic: Mr. Goldberg will discuss how he and his team of agents collaborated with the Ecuadorian Special Police and Military to uncover and investigate the first ever narco-submarine. RSVP: Enter your registration here. 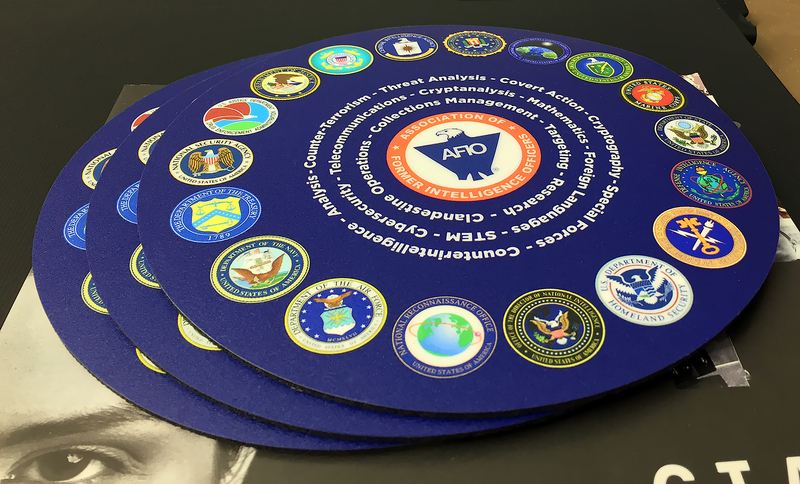 Full color seals of all 18 members of the U.S. Intelligence Community on this 8" round, slick surface, nonskid, rubber-backed mouse pad. Price still only $20.00 for 2 pads [includes shipping to U.S. based address, only. For foreign shipments, we will contact you with a quote.] Great gift for colleagues and self. Click image above for larger image. 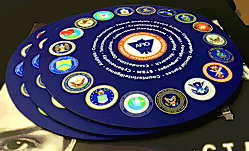 Now with dark navy background, brighter, updated seals of member agencies. And now MADE IN USA. Order MOUSEPADS here. The Guide consists of more than 66 articles on all aspects of intelligence. It is intended to help instructors become familiar with intelligence-related subjects. Guide articles, written by both academic experts and seasoned practitioners, are introductions to the subject with recommended readings for further study. Guide articles appear in AFIO's journal Intelligencer and as PDFs on our website here. They are free for academic reuse. For a complete list of what articles are available at this time, view this pdf. AFIO's 788-page comprehensive Guide to the Study of Intelligence. Peter C. Oleson, Editor. Foreword by Dr. Robert M. Gates, former Director, Central Intelligence. View authors and table of contents here. A thoughtful gift for professors, students, those considering careers in intelligence, and current/former officers seeking to see what changes are taking place across a wide spectrum of intelligence disciplines. AFIO's Guide to the Study of Intelligence helps instructors teach about the large variety of subjects that make up the field of intelligence. This includes secondary school teachers of American History, Civics, or current events and undergraduate and graduate professors of History, Political Science, International Relations, Security Studies, and related topics, especially those with no or limited professional experience in the field. Even those who are former practitioners are likely to have only a limited knowledge of the very broad field of intelligence, as most spend their careers in one or two agencies at most and may have focused only on collection or analysis of intelligence or support to those activities. $95, includes Fedex shipping to a CONUS (U.S.-based) address. AK, HI, and other US or foreign addresses should contact afio@afio.com to inquire about shipping options. To order use this online form. The Guide is available for purchase directly from Amazon at this link. All orders outside the U.S. should order from Amazon. NOW ONLINE: As an educational service to professors and students, AFIO provides the full 788-page Guide online here at no charge. This was made possible through the generosity of our foundation, corporate, and institutional members, coupled with the donations we received from our many individual members. Even with the book online, at 788-pages a printed copy allows a reader to get away from the glare of electronic devices to read sections and articles without a nearby plug. It also allows annotations, underlines, and highlighting to enhance learning and retention of material. Order here. The Guide is available for purchase directly from Amazon at this link. Thursday, 16 May 2019, 11:30 a.m. – Colorado Springs – The AFIO Rocky Mountain Chapter hosts Dr. Gail Nelson, discussing "Thinking in Time: Strategic Intelligence Parameters Today." Synopsis: "Thinking in Time" encompasses the Strategic Intelligence Threats that plague nations across the geopolitical and ideological divide. The brief captures many major challenges by recommending classic Estimative Intelligence Methodologies in Annual Regional and Country Geopolitical Formats for regular review by senior national security staffs thus facilitating the demand for Special Estimates and Crisis Scenario Development during emerging crises. The absence of these finished intelligence products exponentially increases the liabilities of risk management and miscalculation exactly at a time when leaders demand accuracy in assessing adversary intentions in a complex world. Gail Nelson, Ph.D. a veteran DOD Intelligence Officer, received his Political Science BA at California State College, Long Beach, in 1966 and completed doctoral work at the University of Colorado in 1979. His career assignments include US Army Europe, US Air Forces Europe, and US European Command specializing in Russian and East European Geopolitical Affairs. He later was appointed Senior Advisor to the Afghan Chief of Military Intelligence; and performed similar responsibilities in the Philippines and Iraq. His published monographs explore the Political Psychology of Nazi Genocide; Soviet Defense Decision Making; Warsaw Pact Crisis Management; and biographies on Security & Intelligence leaders. He was awarded the Meritorious Civilian Service Medal during the Cold War, the Distinguished Civilian Service Medal in 2001, and foreign advisory recognitions later. For more information or to attend, contact steve13507@gmail.com. Or use this printable PDF Registration form here to be completed and mailed/faxed/emailed back to AFIO. PROGRAM: The tentative program for both days may be viewed here. Wednesday 18 September 2018, 5:30 p.m. - New York, NY - AFIO NY Metro Chapter hosts Larry Loftis, on SOE Hero, Odette Sansom, in his book Code Name: Lise. Larry Loftis is the author of Code Name: Lise—The True Story of the Woman Who Became WWII's Most Highly Decorated Spy, the story of Odette Sansom (1912-1995), a Frenchwoman living in England, wife of an Englishman and mother of 3 daughters, who was recruited into Britain's Special Operations Executive (SOE) to conduct espionage in France during WW II with her commander, and yet-to-be second husband, Peter Churchill. Leaving her daughters in a convent school and with relatives, she joined the rigorous training program, becoming proficient with a wide range of weapons, learning the fine points of spycraft, and perfecting her new identity with the code name Lise. In France she proved herself fearless. Hunted by the Germans, in 1943, Odette and Peter were captured, imprisoned, and tortured. Loftis describes Odette's ordeal in grisly detail. Two lies saved her: She pretended that she and Peter were married (they would be after the war) and that Peter was related to Winston Churchill. In defeat, the Gestapo hoped to use her as a bargaining chip. NOTE TIME CHANGE - Challenges and Opportunities for US - Japan - Korea Trilateral Security Cooperation is the topic of the presentation by James L. Schoff, Senior Fellow, Asia Program, Carnegie Endowment for International Peace, being given at the Daniel Morgan Graduate School of National Security. A major shift in allied diplomatic tactics for handling the North Korean nuclear threat coupled with deteriorating Japan-Korea relations have sapped strength from trilateral security cooperation. This former leader of Defense Trilateral Talks will discuss where trilateral cooperation has been and where it could and should be going. James L. Schoff is a Senior Fellow in the Carnegie Asia Program. His research focuses on U.S.- Japan relations and regional engagement, Japanese politics and security, and the private sector's role in Japanese policymaking. He previously served as senior adviser for East Asia policy in the U.S. Office of the Secretary of Defense (OSD) and as Director of Asia Pacific Studies at the Institute for Foreign Policy Analysis (IFPA). RSVP required and may be done here. Direct questions to Frank Fletcher, Director of Lectures & Seminars by email to: events@dmgs.org. Please note that you must RSVP to attend this event. Daniel Morgan Graduate School of National Security reserves the right to refuse entry. "GCHQ 1919-2019: Reflections at the Start of Our Second Century" will be topic by Tony Comer, GCHQ Historian, at this event at the National Cryptologic Museum in Ft. Meade, MD. The Government Communications Headquarters (GCHQ) was created in 1919 right after World War I. First known as the Government Code and Cypher School (GC&CS), it would run the successful (and now very famous) Bletchley Park codebreaking facility north of London during World War II. Shortly after the war (1946), it would adopt its current name. In his presentation, Tony will offers stories and perspective about this historic organization—and about that special US-UK cryptologic relationship, first established in February 1941. TONY COMER joined GCHQ as a Spanish and Portuguese linguist in 1983. He worked in a variety of operational and policy roles in GCHQ with a primary focus on support to military operations. In 2009 he became Departmental Historian. *** A full house is anticipated, so advanced registration is required. *** Register here. An event flyer is also available here. For more information about the Henry F. Schorreck Memorial Lecture Speaker Series and previous presentations, that information is here. The William H. Webster Distinguished Service Award Dinner will take place at the new home of the International Spy Museum in L'Enfant Plaza. On this special evening, more than 500 attendees will gather to recognize the men and women who have served in the field of National Security with integrity and distinction. Each year, The Honorable William H. Webster Distinguished Service Award is given to an individual who has embodied the values of our esteemed friend, mentor, and leader — Judge William H. Webster. This year's honoree is someone known for his invaluable service and contributions to the Intelligence Community, someone that has worked from the ground up and has been both a provider and consumer of intelligence with more than 20 years of experience. It is with great pride that we announce the 2019 honoree is General Michael V. Hayden, former Director of the National Security Agency, Principal Deputy Director of National Intelligence, and Director of the Central Intelligence Agency. AWARD DINNER CO-CHAIRS: Mr. Michael Morell, Senior Counselor, Beacon Global Strategies and Former Deputy Director and former Acting Director, Central Intelligence Agency; Ms. Jill Singer, Vice President, National Security, AT&T Public Sector & Wholesale; Former Chief Information Officer, National Reconnaissance Office. Tickets range from $495 to $15,000. Explore your registration options here. This event is closed to media. Event location: The New International Spy Museum, 700 L'Enfant Plaza SW, Washington, DC 20024. Directions here. The PENFED Foundation hosts their impressive annual "Night of Heroes Gala 2019" at the beautiful Mandarin Oriental, 330 Maryland Ave SW, Washington, DC 20024. This year marks the 15th annual gala honoring our unsung heroes — military children. Each year, the PenFed Foundation raises more than $1.5 million for military heroes through this hallmark event. Last year's event sold out and raised $2.5 million! Do not miss your opportunity to support Military Heroes. 6 pm General Reception and Silent Auction; 7 pm Dinner Program; After Dinner - Dessert Reception. To learn more...or to register. 5 June 2019, 10 a.m. - 1:30 p.m. - Annapolis Junction, MD - Summer NCMF Cryptologic Program: The Tian'anmen Square Massacre of 4 June 1989 - A Day that Marked a Turning Point in Chinese History with Author Greg Nedved and Dr. Laura Kaplan Murray. On the 30th Anniversary of this significant event in Chinese history, the National Cryptologic Museum Foundation (NCMF) invites you to come and learn about this tragedy from two NSA Center for Cryptologic History historians and experts on Chinese society. We are thrilled to have Mr. Greg Nedved and Dr. Laura Kaplan Murray with us as our special guest speakers. Lunch will follow the morning presentation, and a book sale will include a book by Mr. Nedved, Presidential Foreign Language Trivia. TIMING: 10 a.m-11:45 a.m.program followed by lunch noon-1 p.m.
FEE: Registration Fee, inclusive of lunch, is $25 for members and guests. REGISTER: Register online here or mail your check to NCMF, PO Box 1682, Ft. Meade, MD 20755. To learn more about the topic or speakers, as well as the presentation, do so here. The National Security Agency/Central Security Service (NSA/CSS) and the National Cryptologic Museum Foundation invite proposals for the 2019 Symposium on Cryptologic History. The Symposium will be held on October 17-18, 2019 at the Johns Hopkins Applied Physics Laboratory's Kossiakoff Center in Laurel, MD. The theme of the 2019 Symposium is "From Discovery to Discourse." Proposals are due February 4, 2019. To submit your proposals or for additional details please visit this link. The National Security Agency/Central Security Service (NSA/CSS) Center for Cryptologic History (CCH) and the National Cryptologic Museum Foundation (NCMF) invite proposals for papers to be presented at the 17th biennial Symposium on Cryptologic History which will take place October 17 - 18, 2019. The Symposium will be held at the Johns Hopkins University Applied Physics Laboratory's Kossiakoff Center in Laurel, Maryland. Following the Symposium on Saturday October 19th, attendees will be given an opportunity to tour the National Cryptologic Museum and participate in a workshop on researching cryptologic history sources. The theme for the 2019 Symposium on Cryptologic History is "From Discovery to Discourse." Since 1990, the Symposium on Cryptologic History has served as an opportunity to present historical discoveries found in unclassified and declassified Intelligence Community records and engage in scholarly discussion about their significance to cryptologic history. All topics relevant to the history of cryptology, signals intelligence, technology, and national security are welcome. An interdisciplinary approach is encouraged. Topics anchored by anniversary events are traditionally well-received by attendees. Just two examples of significant anniversaries in 2019 include the 100th anniversary of the establishment of the British Government Code and Cypher School (now known as the Government Communications Headquarters or GCHQ) and the 70th anniversary of the establishment of NSA/CSS' predecessor, the Armed Forces Security Agency. Submissions from those who are new to the field, particularly graduate students, are particularly welcome. This will ensure the variety and diversity of exchange that has been the hallmark of this event. how you can qualify, how long they take, and what can put them in jeopardy. Intelligence as a Career - with updated listings of colleges teaching intelligence courses, and Q&As on needed foreign languages, as well as the courses, grades, extracurricular activities, and behavioral characteristics and life experiences sought by modern U.S. intelligence agencies. AFIO's popular 56-page booklet reaches high school and college students considering careers in the U.S. Intelligence Community. This is the fourth edition. The publication is also popular with University Career Guidance Centers, professors and academic departments specializing in national security, and parents assisting children or grandchildren in choosing meaningful, public service careers. This booklet is provided at no cost as a public service - online and in print - from the generosity of AFIO board, donors, and members. 20,000 printed copies of each edition are distributed. Many more PDF copies are accessed online. We thank all members for their support which makes this educational effort possible. Careers Booklet (fourth edition) in PDF Format available here. Cannot open some or all of these PDFs? It can mean your PDF viewer is out-of-date. Use this link to update your viewer to the latest version. For the tenth consecutive year, the Intelligence Community (IC) was honored to be in the top-ten Best Places to Work in the Federal Government, according to an independent analysis of federal workers' job satisfaction and commitment. See more about the ranking here. The rankings were compiled by the Partnership for Public Service (PPS) and American University's Institute for the Study of Public Policy Implementation (ISPPI) and announced recently in Washington, D.C. PPS is a nonprofit, nonpartisan organization that aims to attract people to federal careers and improve how the government runs. The institute conducts research and helps federal leaders solve difficult public-policy issues. The IC ranked fifth overall among large agencies, which includes over 17 organizations, each of which employs more than two thousand people. Rankings are based on data from the 2018 Federal Employee Viewpoint Survey, which the U.S. Office of Personnel Management administers. The first Federal Government survey was in 2003, but the IC has only participated since 2009. Max Stier, president and CEO of the Partnership for Public Service, noted that the IC does not have to participate but does so voluntarily, "which is a credit to them." To maintain the security of information about its work force, the IC relies on its own survey instrument to assess each year how its workers feel about issues such as job satisfaction, professional development, and the effectiveness of senior leaders. The IC includes several questions from the federal survey in the IC's annual Employee Climate Survey. That way, the Community's information can be compared with that from other organizations. Other top-five large organization Best Places to Work are: The National Aeronautics and Space Administration, HHS, Commerce and Transportation. Visit bestplacestowork.org to see which agencies top the rankings and to access trend analysis, demographic data and various workplace categories, as well as generate custom reports and conduct side-by-side comparisons for up to three agencies. 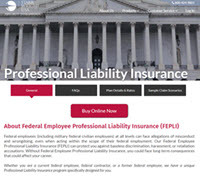 Agency, University, Foundation, or Corporate Members - use this Online Form or this pdf document. Student Rates: U.S.-based Students, 28 years old or younger, attending a U.S. nonprofit accredited college, may join 1x at special rate. Email us at afio@afio.com with your info for application and rates. Rate not available to current or former members. Use this form to apply for student membership. New Email or Mailing Address? Provide here. Movies of Interest to members can be found here. Are You Right For It? Click HERE, or the cover photo above, for the updated version Booklet. Help AFIO continue our Special Events, Publications, and Speakers Program. © 2019, 2018, 2017, 2016, 2015, 2014 AFIO - Association of Former Intelligence Officers, All Rights Reserved.